Marine shorelines in Puget Sound perform unique and critical ecosystem functions, providing the substrate for eelgrass and kelp and supporting shellfish production, foraging by marine birds, rearing and migration for juvenile salmon, and other services. These shorelines consist mainly of coastal bluffs and sea cliffs. Sea cliffs are rocky cliffs with low erosion rates, often dropping steeply into deep water, and are more prevalent in northern Puget Sound, particularly the San Juan Islands. Most of Puget Sound’s shorelines are coastal bluffs, which are composed of erodable gravel, sand, and clay deposited by glaciers over 15,000 years ago (Downing, 1983; Shipman, 2004). 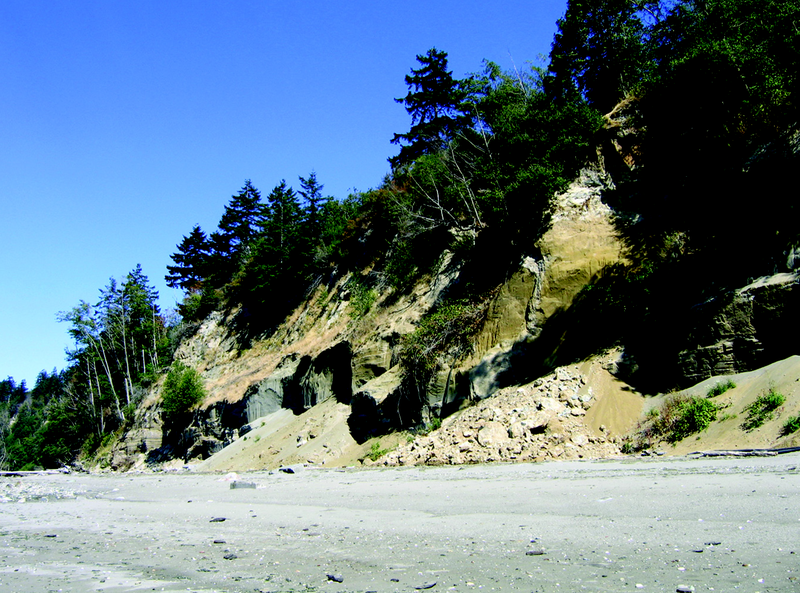 Along the marine shorelines of Puget Sound, the erosion of bluffs is essential to the formation of beaches, sand spits, berms, and other features. River sediment is also an important contributor to Puget Sound beaches (Figure 3-9). 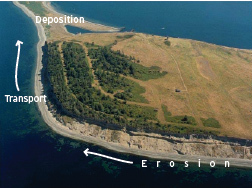 Beach habitats along coastal bluffs are commonly delineated into “drift cells” consisting of zones of beach-sediment transport separated by headlands, embayments, or other landscape features. The volume of material added to beaches from bluff erosion is also closely related to wave energy, as the sediment within a drift cell is moved along the beach by waves breaking along the shoreline. Hundreds of drift cells and net drift directions have been mapped for most of the Puget Sound shoreline (Department of Ecology, 1978; http://www.ecy.wa.gov/programs/sea/SMA/atlas_home.html; Schwartz et al., 1989; Schwartz et al., 1991). Extensive development of coastal bluffs along the Sound has led to the widespread use of engineered structures designed to protect upland properties, railroads, and roads. However, shoreline armoring can also interrupt sediment-transport processes, leading to burial or starvation of beaches in specific locations, increased wave energy or scour, and changes to habitat types such as eelgrass meadows, mud flats, and saltmarsh. These modifications have increased dramatically since the 1970s with substantial deleterious effect on the ecosystem health of the Sound (Thom et al. 1994). Species of forage fish that spawn in the upper tidal zone depend on the natural nourishment of beaches through coastal bluff erosion. Hundreds of miles of spawning habitat for surf smelt (Hypomesus pretiosus), for example, are known to exist along Puget Sound and many beaches have yet to be surveyed for evidence of spawning activity and timing of use. Disruption of sediment-transport processes, or even beach renourishment projects, can damage forage-fish spawning activities (Moulton, 2006). In addition to shoreline armoring, the removal of the marine riparian forest corridor along Puget Sound has reduced the habitat available to many species of wildlife that travel regularly between the terrestrial and saltwater environment or along shoreline corridors. Raptors and many shorebirds rely on forested lands for roosting in close proximity to foraging areas in the estuary (USDA Forest Service, 1985). Sediments ranging from gravel to fine silts and sands are eroded from river edges and transported downstream and into estuarine and nearshore habitats. These river sediments provide important gravels for salmon spawning and rearing in the freshwater system along the way. Further downstream, sediment is deposited at the river mouth, forming extensive deltas with freshwater and saltwater marsh habitats for a multitude of fish, bird, and supporting species. More far-reaching impacts of river-borne sediments also affect the Puget Sound marine environment. For example, suspended sediments carried into the Fraser River plume attenuate the light in the upper water column, thereby causing declines in primary productivity. Sediment is not the only factor affecting habitat formation along the terrestrial-aquatic interface. While the importance of large woody debris is well known for habitat formation within rivers and streams, the delivery of wood to deltas and shorelines is also necessary to ameliorate shore erosion and enhance nearshore habitats. This is especially the case in river deltas, where the wood can break up saltmarsh and form patches of habitat for terrestrial species. Historically, delta forests often consisted of sparse spruce, pine, and alder groves and served as important habitats for many Puget Sound species such as raptors and beavers. The beaver modified and constructed expansive freshwater wetlands, used in turn by other species including juvenile salmon. Saltwater and freshwater marshes, and sand and mud flats on deltas, were historically dominant parts of the Puget Sound landscape, providing critical habitat and transitional zones for young salmon and many other species of birds, fish, and mammals. 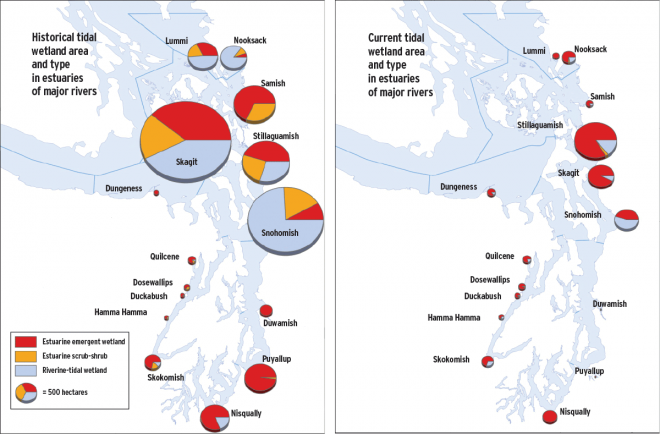 Physical destruction of habitat resulting from human-development activities along river deltas has been severe in several major river systems in Puget Sound. Extensive marsh and nearshore habitats were eliminated by levees that separated rivers from their floodplain and delta, eliminating thousands of acres of habitat. Changes in upstream hydrology have also changed circulatory patterns and sediment deposition in nearshore environments. For example, the concentration of flow into a few channels at the mouth of the Skagit River, and increased sediment delivery immediately offshore of these channels, is fragmenting eelgrass meadows and altering sea-surface salinity and turbidity that can affect the migratory pathway for outmigrating juvenile salmon (USGS, Grossman; pers. comm. 2006). Delta habitats have also been affected by activities such as upstream culvert placement, which can create hydrological changes that accelerate upland erosion and contribute to downstream sedimentation problems. Increasing urbanization and industrialization of many river deltas, including those of the Duwamish and Puyallup, have been so altered that there virtually remains no indication of their historical extensive saltmarsh habitat. These cumulative physical changes have led to dramatic habitat loss for salmon and other species that reside in, or transit, delta habitats. Damming of rivers has locally reduced the flow of sediments to key nearshore environments, most notably at the mouth of the Elwha River. Such reductions have resulted in significant beach erosion, costly shoreline protection measures, and loss of nearshore habitats. Dams have further restricted the river habitat accessible to salmon, reducing habitat capacity for salmon and eliminating the return of marine nutrients to portions of river food webs.